Lock in a great price for Hospedería del Atalia – rated 8.8 by recent guests! Convenient location in old town near the Mezquita. It shares the gate and courtyard with a block of private residences so it feels less like coming back to a hotel and more like coming back home after a day of sightseeing. Quiet and charming place. Nice staff. So happy I booked Atalia Hospedería for my two day visit in Cordoba. Highly recommend!!!!! Location is amazing. They had a very cosy roof where you can enjoy the sun if you are visiting during the winter. The room decoration added to the whole Cordoba ambiance. The shower is really good with several options. Great value for money. Note: it is a bit tricky to reach by car. So, park your car (for free) on the other side of the Roman Bridge and walk to the hotel. They had someone make real café con leche with an espresso machine every morning. Great location near Mesquita and Juderia. Location is just perfect. Couldn't be better. The room and common area are fancy. Located in the old quarter the hotel is set back a good distance from the street on a gated patio making for a quiet location yet it's only a two minute walk to the Mezquita. The staff is friendly and helpful. A very good value for the location. The room was very spacious and delightfully furnished. The bathroom is huge, and we had a sitting room and private courtyard in addition to the bedroom. Everything was spotless. The sink was a work of art. The staff was very kind and helpful. If you ask, you can get a drink and carry it up to the roof patio which is lovely at the end of a day. We'd definitely stay here again! Hospedería del Atalia This rating is a reflection of how the property compares to the industry standard when it comes to price, facilities and services available. It's based on a self-evaluation by the property. Use this rating to help choose your stay! 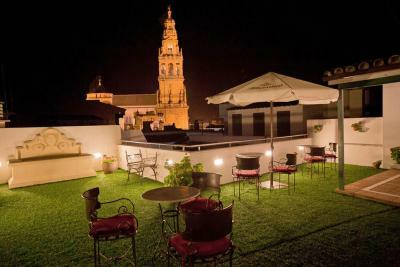 One of our top picks in Córdoba.Hospedería del Atalia is in Cordoba´s Jewish Quarter, and its roof terrace has views of the Mesquita. This hostal offers air-conditioned rooms and free WiFi in public areas. 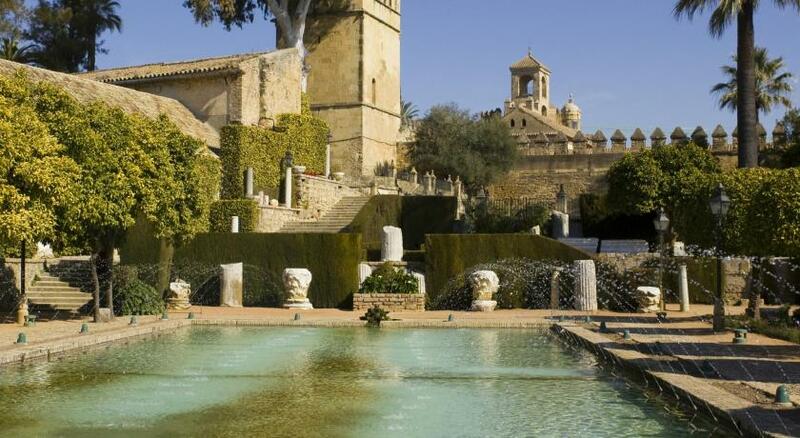 The Atalia is just 150 feet from Cordoba’s historic Mosque. The Synagogue and Roman Bridge are a short walk away. The city’s modern center is also nearby. Hospedería Atalia has classic-style design. There is an elegant lounge with a small fountain. Drinks are available in the bar or outside on the terrace. The Atalia’s 24-hour reception includes a tour desk. 뀐 Located in the real heart of Córdoba, this property has an excellent location score of 9.5! When would you like to stay at Hospedería del Atalia? This spacious room has a living area, private bathroom and a 98 ft² terrace with street views. It comes with 2 single beds. Air-conditioned room with a flat-screen TV and private bathroom with a hairdryer and toiletries. This spacious suite for up to 4 adults consists of 2 spaces both equipped with a flat-screen TV, desk and twin beds. The private bathroom includes a hydromassage shower. Extra beds or baby cots cannot be added to this room type. No baby cots or extra beds can be added to this room. This air-conditioned room features a flat-screen TV and a private bathroom with hairdryer and toiletries. 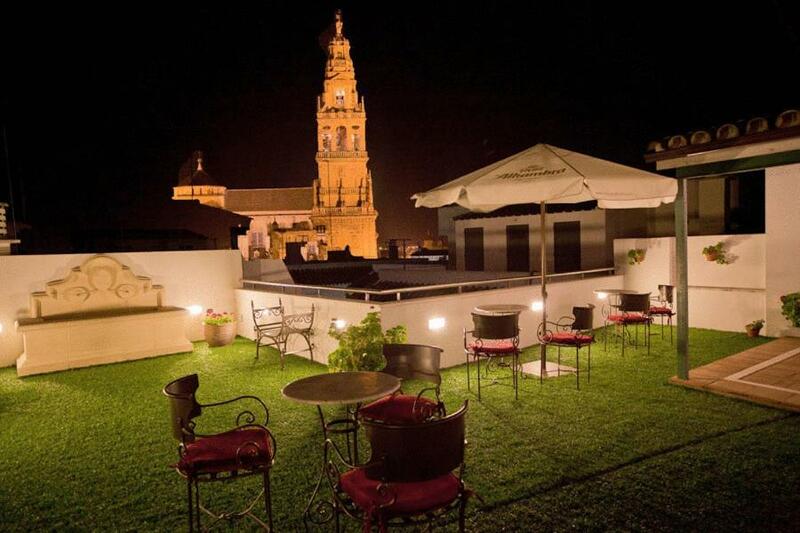 Hospedería del Atalia is in Cordoba´s Jewish Quarter, and its roof terrace has views of the Mesquita. This boutique hotel offers air-conditioned rooms and free Wi-Fi in public areas. 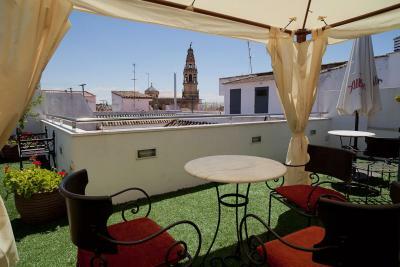 The Atalia is just 50 metres from Cordoba’s historic Mosque. House Rules Hospedería del Atalia takes special requests – add in the next step! Hospedería del Atalia accepts these cards and reserves the right to temporarily hold an amount prior to arrival. Our heater didn’t work and they Didn’t offer another room or a discount but supplied an electric heater that magic took off the cold at night shower temperature nozzle wasn’t working had to force it into position to keep from scalding yourself. Driving in and using their parking was a challenge but a great travel tale. All in all these were minor issues but for the nightly rate one would of hoped for a bit More. There was only one time when I had not taken enough warm clothes out for the day and came back in the early afternoon and it was a struggle to get buzzed in through the gate, but coming & going other than that time was fine. The room was a little stuffy but I learned it was still too chilly in March to leave the window open all night. It would be fine in warmer months though as quiet. Also the room was a little dark i.e. there was no light over the full length mirror. The location is fabulous (a bit of a hike from the train station but once you're there you are close to everything!) being on a back (very pretty!) courtyard meant it was both central & quiet. The room is clean, breakfast tasty, staff courteous and helpful. There is also a great roof terrace! Overall great value for money!! Great location. A few steps from the Mosque and Alcazar surrounded by restaurants and shops. A hidden gem. Small and cosy hotel. Easy to get to. Superb, polite staff. Comfortable lounge area. Adequate breakfast. Would certainly go again. Compliments to the staff. Trying to park!!! Save on the nerves and park in the nearby 24 hour car park outside the city walls and walk an easy 10 minutes in!!! Calm quiet courtyard in the heart of the historic area. Excellent bed and shower!!! Breakfast was good quality and plentiful. The staff helpful and had good English. Nico in particular was very attentive to all our needs. Service with a genuine smile. Roof terrace views - amazing!! We had a window that opened over the reception and breakfast area and could hear easily people. Very central. Very nice building. Spacy room. Extensive breakfast options. The room was much larger than we expected and was very comfortable and clean. The location is about a 20 - 30 minute walk from the train station and only a few minutes walk to the Mezquita of Cordoba. There are many places to eat nearby and lots more if you venture in to the old town. The breakfast was excellent with choices of cereals, meat, cheese, bread and fruit. The coffee was served freshly made and tasted good. Thank you to the reception staff. We would stay again. in a good position for walking around and seeing the sights. 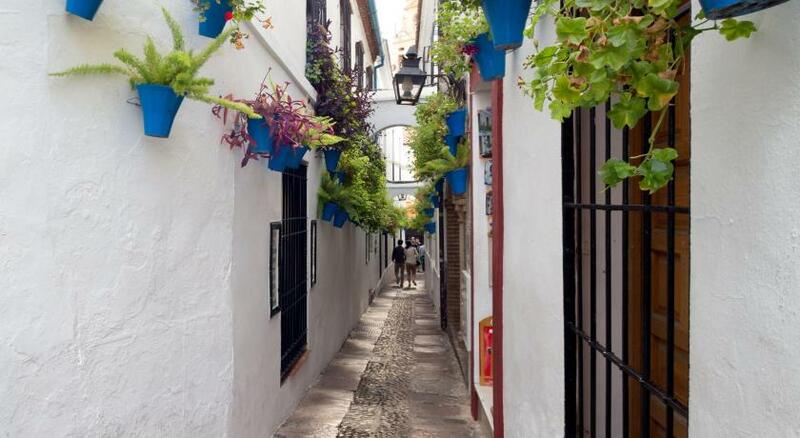 Excellent location to visit Cordoba's old city. Hotel was very clean - good breakfast - charming room. The roof terrace was closed during the whole of my stay. This was one of the reasons I chose this hotel. Construction work on the roof terrace started at 8am on Thursday morning.